I planted a prodigious amount of basil this year. Like, a LOT, a lot. After a summer of pruning here and there to make pizzas and pestos, it was time to cut everything down and see what I had. Nice. THAT’S what I want to hear at the end of the growing season! I portioned it all into quart-sized ziploc baggies and froze them flat- I ended up with 8 cups of pesto. Not too shabby! From start to finish, this is how I process a crate of apples. Most years I get 2 or 3 crates of apples from my mom’s trees, and this year I got some extras from a friend who didn’t have time to process a few boxes of “seconds” apples before they went bad. 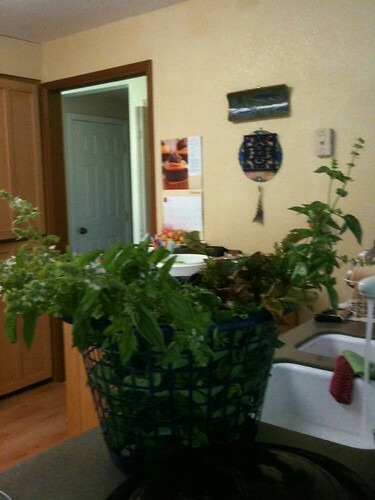 Empty the crate into the sink, weeding out any moldy or squishy apples. For me, I am entirely OK with holes and little blemishes that I can cut out, especially if I am going to be cooking it for days into apple butter. But if a worm hole grosses you out, pitch it. Fill the sink with cool water, to wash the apples. Slice apples into halves (or quarters if they’re huge) and fill a large stock pot. 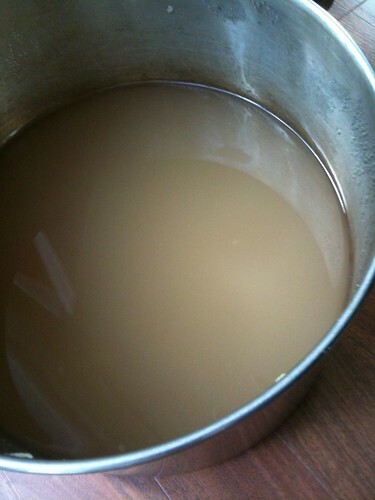 Add a few cups of water to the apples in the stock pot, and set on the stove to bring to a simmer. Make sure it doesn’t boil dry, and cook 5 or 10 minutes till the apples can be pierced easily with a fork. 6. 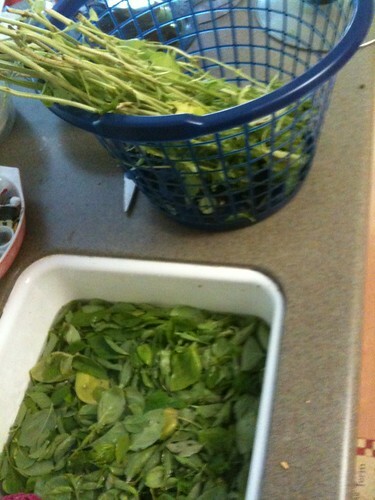 Throw away the refuse (peels, seeds, stems). Put the apple sauce puree into a lined colander, over a large bowl or pot. Let it drain. 7. If you started with a mix of ripe and unripe apples, the juice that drains out can be considered pectin- it will be a thick, silky liquid. I’ve never cooked with it, but this woman has very clear instructions. At the very least, it could be cooked down into a delicious glaze for desserts, sauce for ice cream, or used as a syrup with sparkling water to make apple soda. If you started out with very ripe apples, there will have been very little natural pectin remaining, and the juice that you’ve drained off can be brought to a boil, decanted into hot and sterilized quart jars, and processed in a water bath for five minutes to seal. You MUST bring the juice to a boil before you can it, to kill off any germs. I like this juice best when I mix a few different types of apples. 8. 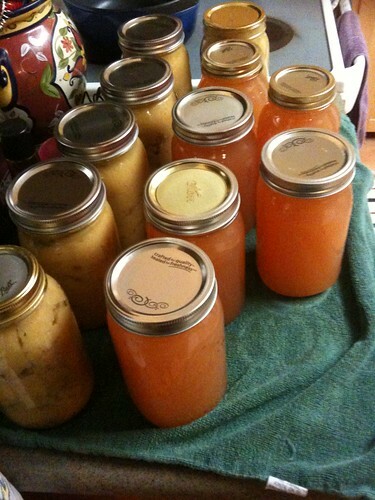 The drained apple sauce can either be brought to a boil, funneled into hot jars, and processed for 25 minutes in a hot water canner, OR you can put it in a crock pot (with the lid ajar and heat set to low) for a day or two until it is thick to your liking. I prefer to add a bit of cinnamon or other “pie” spices at the end, to taste. It can be spooned into pint or smaller jars, and processed 25 minutes in a hot water bath canner. I have never used sugar in either my sauce or my butter, and have always felt it was plenty sweet. 9. Let your jars sit overnight on a towel, then check to make sure the lids sealed, remove the rings, and rinse everything off before storing the jars away in a dark and cool place. 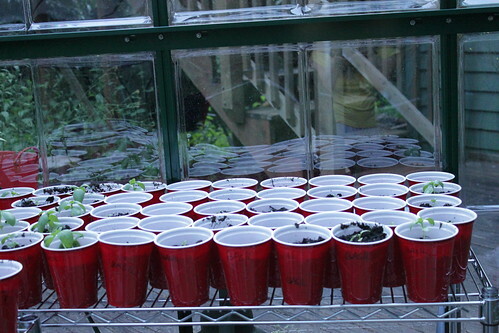 We leave our army of tomato-seedling-filled beer cups in our green houses until they’re nice and big, and the weather has warmed up. Once that’s happened, they’re transplanted outside. This is normally in June or July. This year, I took my biggest transplants and moved them to gallon pots in May and June, to give them bigger root systems before putting them in the ground. 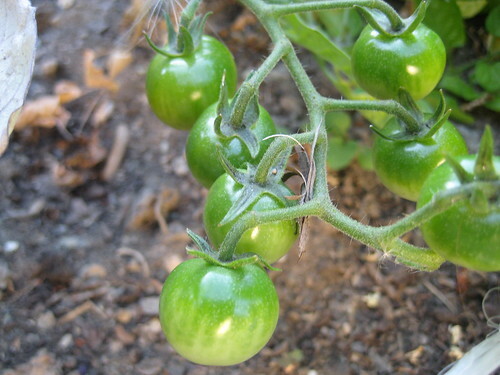 Tomatoes can send out roots wherever their stems touch dirt, so I de-leaf the bottom half of the vine and bury it. In years past, I’ve put my tomatoes in pots. While lots of people have huge success with this (including my mom) I never do. That’s probably because I’m not the most conscientious waterer, and plants in the ground are more forgiving about water since they can find their own. Now, I put them in the ground, again burying the bottom part of the stalk so I can get a stronger root system. I discovered my favorite staking method this year, and it surprised me: I found plastic “bamboo” stakes in the shed, left behind by a previous owner. They’re about a 1/4 inch thick, and four feet tall. 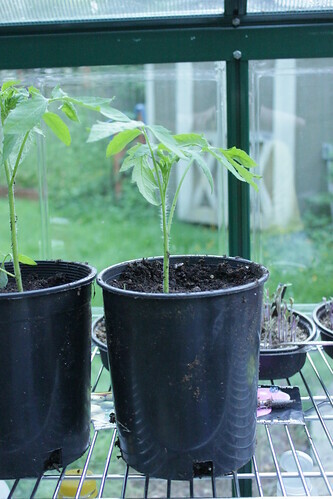 I stuck them in the ground behind the transplants, and used a rubberized wire to twist-tie the tomato vines to the stakes as they grew taller. Next year I’ll remember to snip off the top of the vine once they reach the top of the stakes, but even without this they did great this year and nothing fell over. We had such a cold, late, summer this year that none of my large tomatoes (roma and Early Girl) ever turned red. Not even close. 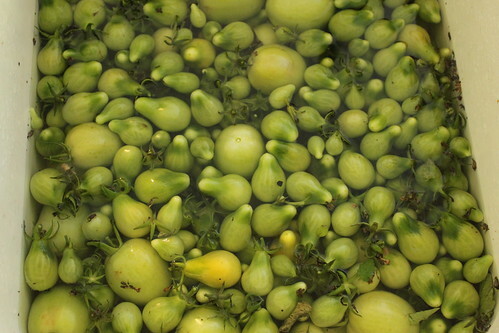 I got a handful of yellow pear cherry tomatoes, but nothing to write home about. When the Fall rains started, I harvested every tomato I could find. I put all the big tomatoes into a cardboard box, in two layers with some newspaper in between. I intended to just store them in there until I used them in curries or salsas, or found recipes to use them in. As of right now, three weeks after that harvest, fully 3/4 of my big tomatoes have ripened and are delicious! 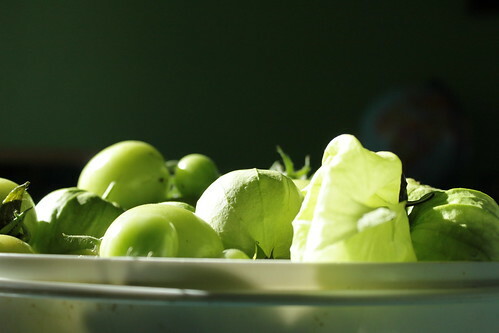 Totally surprised me- next year, I’m going to harvest tomatoes as soon as they’re full-sized and let them ripen inside. 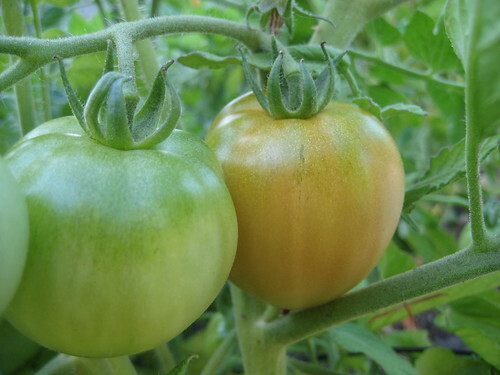 I’ll get ripe tomatoes all summer, and the plants will focus on the next crop of tomatoes when I remove the most mature fruit. What I’ve not eaten, I’ve been throwing into gallon ziploc bags and putting them in the freezer for later. From what I’ve read, I’ll be able to just thaw them and the skins will slide off. Then, I can cook them into quick sauces, soups, salsa, etc. As my “end of harvest season” work load ramps up, I find myself using my favorite tools over and over. So, here is my list of Big Ticket Items that make this kind of life easy. Well, easier. Also, in the interest of making myself feel better, NO. We did not spend thousands of dollars kitting ourselves up in style. We’ve been lucky to gift, thrift, or exchange for the bulk of these items. In fact, the freezer is the only one we went to a store and bought straight out. I’m only printing this list in the spirit of sharing what has really, REALLY helped alleviate the work load for me. Deep freeze. You can always find pounds and pounds and POUNDS of meat, cheese, fruit, vegetables, nuts, and pre-prepared foods in my freezer. (Bulk batches of gnocchi and pot stickers, anyone?) What would be better? An upright freezer would be an awesome substitute for this. On the plus side, easy to organize, easy to find space to “flash freeze” things on cookie sheets, and easy to find things. On the down side, more expensive to purchase, more expensive to run. 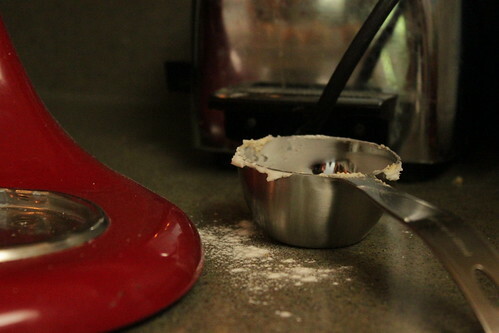 Stand mixer. I have a shiny red Kitchen Aid. (Well, it would be shiny if I took the time to clean it properly, daily. Let’s not nitpick.) Our family eats roughly a loaf of bread every day, so I make two-loaf batches every other day. Roughly. A two loaf batch fits perfectly in my mixer, and it is SO NICE to put everything in, turn it on, and walk away to let it mix. I come back every so often to add more flour or check on the dough ball, but my hands-on time is cut down drastically. What would be better? A bosch mixer can handle much larger batches of dough, so if you’re wanting to make mondo batches of bread (up to 4 loaves at a time) Bosch is the way to go. Or, do it by hand. But that’s not really the point of this list, is it? Grain mill. I have the WonderMill, and love it. L.O.V.E. No, it’s not cheap. But, I can get white winter wheat for 46 cents per pound, bulk, and make bread that would cost $4 at the store. It’s healthier, it’s cheaper, it tastes better, and it will pay for itself! One thing about this mill- it only makes flour. No cracked wheat. No cornmeal. 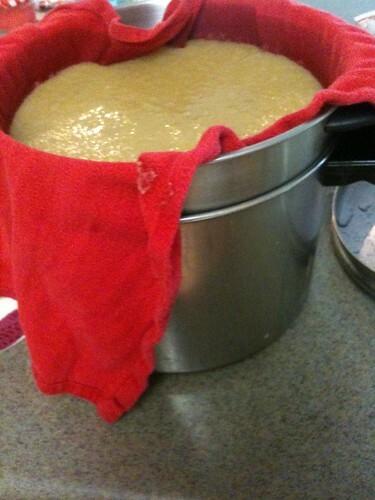 Grinding wheat and popcorn together makes the best corn bread you’ve ever had, but you can’t grind your own polenta. It will grind any grain, bean, or seed provided it isn’t too oily. I’ve even ground my regular short grain rice to make a pretty decent mochi, when the craving strikes. A big, fat blender. 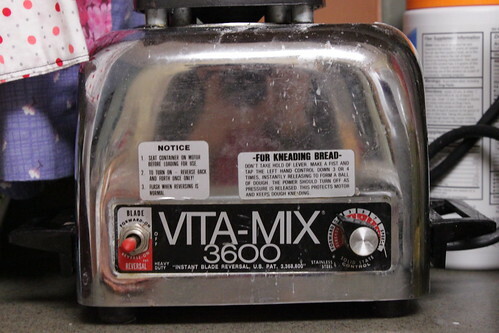 I have a VitaMix, inherited from my parents. Yes, it’s 30 years old. Yes, it’s chrome. Yes, it’s a BEAST and I love it. 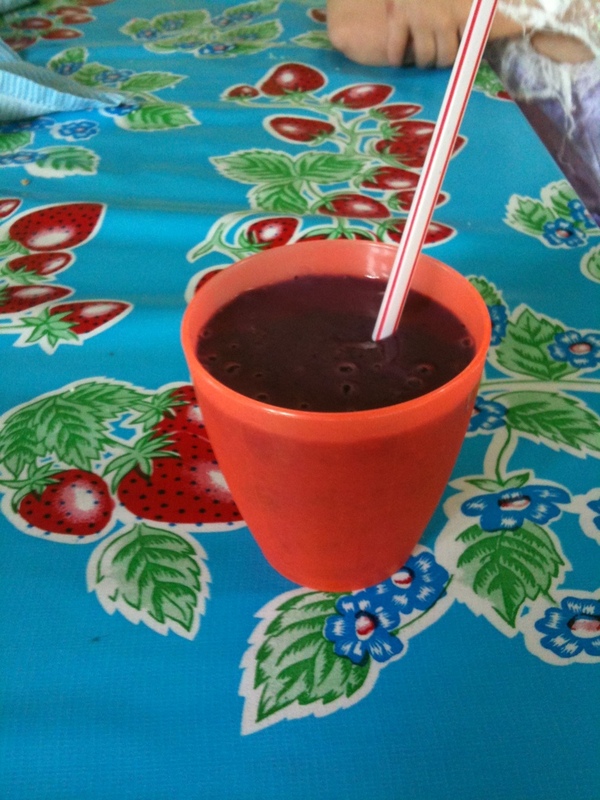 We use it for smoothies almost daily, plus soups, sauces, hummus, bean dip, etc. If this thing ever dies, I am going to use the Vitamix “trade up” credit to send it in and order a new one! (You buy a Vitamix from the company, then send in your old one and they’ll refund $100 as a “trade up” credit. Sweetness.) Oh, and I’ve heard that this blender can double as a grain mill! This particular model, I’ve not been impressed with the flour I got out of it. 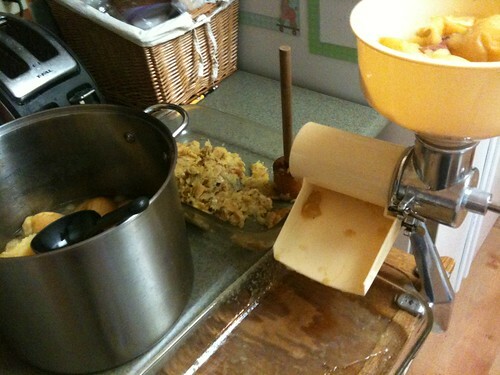 However, a chef friend has a newer one, and doesn’t even bother with his grain mill anymore. And there you have it! What’s on YOUR list of “don’t wanna live without it”?